Scan to BIM is a product from IMAGINiT/Avatech Solutions with a fully functional 30 day free trial that you can use with Revit 2011 (Revit Architecture, Revit Structure and Revit MEP). Details for the monthly public webcast on Scan to BIM can be found here. With Revit 2011 Open, go to the Add-ins tab and look for the section called Scan to BIM. We first need to tell Revit which Point Cloud we want to use in the project, to do this select the Setup button. Note: We are now ready to start working with the point cloud, at this point it will not be screen. We also may not be sure of the orientation, if this is the first time you are working with the point cloud follow along the next steps, if you have already done the setup and worked with it before you can skip ahead and start working like you were when you left off. From the Tools pulldown, choose Outline PointCloud. This will place a "box" around the extents of the point cloud using model lines. From this we can get a sense of where this is placed (based on the point cloud orientation and the Revit model). Choose OK, from the pop-up. Next from the Tool pulldown, choose Create Sections. This will prompt you for the number to place along the X and Y axis, as well as the depth of the section cut. This helps us to understand the Z heights and how this relates to the current levels. Choose Ok. If the level lines are not shown or off the screen, you may need to open an elevation view to extend the level lines to run through the box created in Step #3 above. With the Section View open, select the Update View button and set the decimation to the lower end (to the left) and choose update. This will take a brief moment and update to show the point clouds in the Section View. This gives us enough detail to understand where the Point Cloud is placed in relation to the X, Y & Z offset and compare to the Revit level lines. From here you can decide whether the levels need to match the point cloud (which you can use the reference tools to adjust the levels to match the model) or measure and within the Scan to BIM Administrator override the offset values (that is move the X, Y and/or Z value as well as the rotation of the point cloud) for a permanent change. Following along with the video we are using the Reference Point tool to pick a point through the point cloud and using the built-in modification tool ALIGN to match the level lines to the locations within the point cloud based on interacting with the points. This initial time it takes to go through the 6 steps above, typically only has to occur the first time you are working with the data as you get oriented with the point cloud. After this, you can just use the setup button and then update your working views and move on with the reference tools and geometry recognition for your Scan to BIM conversions. Feedback is great and if you have a specific workflow or Scan To BIM question take a moment to share in the comments. Start by clicking the connect button in the upper right, which creates a connection to the database. Existing point clouds that have already been imported will be shown in the list at the bottom. To add to this list, start by choosing the Import Cloud button. Press the Pre-Scan button and when completed press the OK button. Note: The time for the initial import process varies from a minute to longer for larger, more complex scans. Once completed you will receive a small dialog that lets you know the process is complete. The Import is a one-time process that you use to take point cloud scans and convert to use for Autodesk Revit to Visualize and Interact inside of the Revit design environment (both Project and Family level, Concept Mass Family). In the next post we will be covering some more details about the workflow once you get a scan imported and how to use with your own templates. Feedback is great and if you have a specific workflow or Scan To BIM question let us know in the comments. At Autodesk University 2010 we launched the product, Scan to BIM, and since then have delivered some minor updates and the next release is just around the corner. With the dust from the merger between Rand, IMAGINiT and Avatech now settled outo it is time to get back to writing. This month Matt and I wrote a column for Structural Engineering and Design which covered scanning at a high level. Let's get this started by answering some of the common questions that come up about the product and then move into some other detail. Question 1: What version of Revit does Scan to BIM support? Question 2: What file formats can I import into the STB product? Question 3: In some of the presentations you have shown the current state of the art process, without Scan to BIM, can you share this? Answer 3: Sure, but I do not take credit for the workflow. This comes from people like yourself doing this today. Parts of this were also talked about at the last SPAR conference (which if you work with scanning data, would be a great one to attend). The process is to take the scan data from the hardware and get this to a Revit model involves anywhere from 2-5 pieces of software that range in price from $3,000 - $30,000 USD. Question 4: Does my Revit file size increase when I use point clouds? 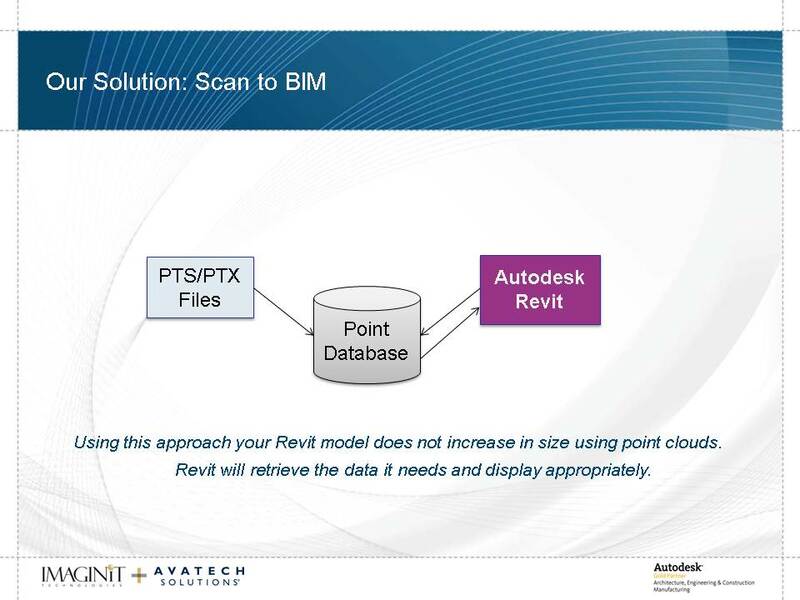 Answer 4: No, if you have a 250MB Revit model and use a 5Gig .ptx file the Revit Model stays 250MB. With this approach the point cloud resides in a database and Revit will push/pull the data it needs to display and interact with. Question 5: I see you have a trial of the Scan to BIM software, can I use my own data instead of the sample dataset you provide? Answer 5: Short answer, Yes. Answer 5: Long answer, leading up to the launch of the product there was a small pool of people we found that were actually doing Scan to Model conversions and we wanted to make this as straightforward as possible to the general Revit users that would be new to this process. So we limited you to the sample dataset we provided and in the first few days, this was the #1 complaint and so we removed this limitation and sent a note about this out to those who had downloaded the trial to update to the new version. Since that time you have been able to use your own .pts/.ptx files within the 30 day fully functional trial (with no limitations). One last item, which we found two weeks ago was the automated e-mail that goes out with the trial authorization which after our update still said it was limited to the sample dataset that we provide (even though you could use your own data). We kept wondering where this question was coming from and after some sleuthing, found and fixed the culprit. So there are some of the top questions we get about Scan to BIM. In the next few posts we will answer more as well as offer some more insight on usage and how to's. If you have a specific question, workflow or Scan To BIM question let us know in the comments. #YearinReview What did you ship/complete in 2010? Launch 100 Percent, 4-in-1 Percentages Calculator for iPhone and iPod devices. Launch Fun for Kids: Activities for Your Family, Activities, crafts, games and entertainment ideas for kids of all ages for iPhone and iPod devices. Launch Avatech Utilities for Revit 2011, includes 11 utilities in the full package for Revit Architecture, Revit Structure and Revit MEP with 3 entirely new tools and user interface adjustments to each to streamline usage. 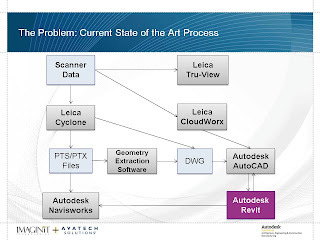 Co-Author Introducing Autodesk Revit Architecture 2011 with Pat Davis, Charlie Busa, Steve Stafford and Beau Turner. I did not do all of this myself... far from it. Thanks to everyone involved in these projects and for readers, users, volunteers, beta testers, colleagues, marketing, paying customers and more that made these projects happen. There were additional private development items that cannot be mentioned :\ and another twelve to fifteen projects that were started and underway but were not launched in 2010 and as Seth said "If it doesn't ship, it does not count".